There is something magical in the name, because every time I hear it, the words remind me of Rudyard Kipling’s lovely poem. Yes. 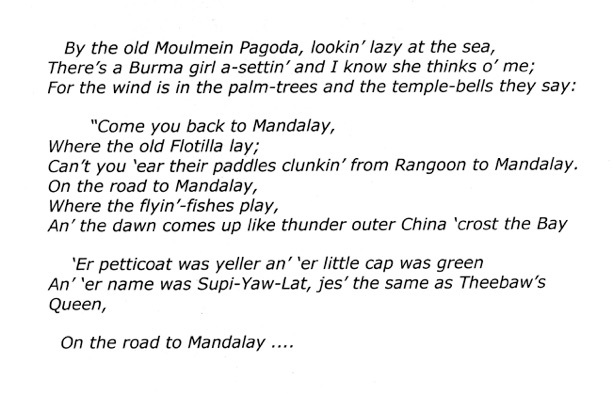 And now we were in Mandalay. From Bagan we could have taken a leisurely boat trip on the Ayeyarwady river and reach Mandalay in 8-10 hours. If we had felt the need for penance, we could also drive over atrocious roads to get there, also in 8-10 hours. But we opted to fly. The flying time between the two cities was only 25 minutes. Like many things which we have imagined for so long, reality is always a let-down. Mandalay is a large provincial city. Downtown is a huge square palace area in the middle guarded by a wide moat and impressive walls. The air was dusty and the leaves of the trees on the sides of the road were all covered with a layer of grime. It must not have been the case in Kipling’s time, but I was glad when we left the city a few days later, because the dust was seriously affecting my respiration. On the outskirts, however, there are some beautiful suburbs, such as Sagaing, and after visiting them one can imagine how many people love to live here. If it were not for the dust! Our guide was in a hurry to get to this monastery, which was home to several thousands of young monks. At 10:15 a.m. they are given their daily and only meal and tourists flock here by the hundreds to see them getting their food. Tourists jostle for position outside the enclosure for better camera angles, and some climb on the balconies of the adjacent building for better views. It is actually embarrassing, as if we were watching animals in a zoo being fed. But tourists are tourists and some of these insensitive clods will even walk into the enclosure to stick their cameras right in the faces of the monks. The monks keep silent. right: Monks silently line up for their daily bowl of food. In the middle there is the group of givers for todays food. A giver will gain considerable merit in Heaven by feeding these monks. 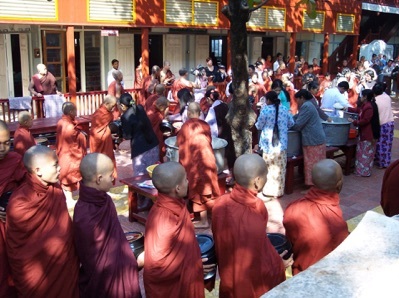 A small group of donors, very nicely dressed, were standing there in the courtyard ladling the rice and the accompaniments they have brought, into the lacquered rice bowls of the monks as they patiently queue and wait their turn. The tourists then rush to the dining halls to make pictures of the rows and rows of monks silently partaking their food. It borders on the repulsive. The Thein Nyo Weaving Shop. In a hall women were busily weaving on rather outdated weaving machines. I suspect they were paid not more than 1000 kyat per day. But this does not prevent the owners of the shop to charge prices commonly seen in upscale department stores in Beverly Hills. They do have nice shawls, tablecloths, etc. And just a few hundred miles away, the Chinese are also weaving, using state-of-the-art computer-controlled weaving machines, able to produce ten times as much per employee. I wonder whether many of the products they sell in this shop were not produced elsewhere, such as in these Chinese factories. At the slow leisurely pace the women were producing the weaved products, it seemed it would be difficult to cover the demand of the hordes of tourist ready to part with good money for high-quality “local” artifacts. This ancient city was the capital of the Burmese kingdom for some 400 years. It is on a promontory, but the Myittha Canal has been dug to connect the Myitnge and the Ayeryawady rivers, so now Inwa is an island. As soon as we stepped out of our bus, we had to run a gauntlet of persistent postcard and souvenir-wielding vendors before we were able to board the ferry. It was just an open barge, but we needed it to get to the island. It is a bit touristy there. 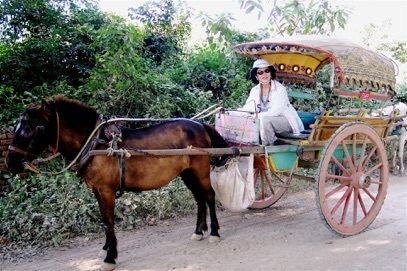 Motorized vehicles are not allowed and to get around one has to use a horse-driven cart; two to three passengers per cart. Which is rather fun anyway and it helps the economy. The island is too big to explore by foot. Note, that to keep the roads clean, the horses are provided with bags below their tails, so the island is not littered with horse-dung and the associated flies and smell. It should be made mandatory in more tourist places in the world. It is certainly more pleasant to walk around without having to watch out where you put down your feet. wooden floors a few feet above the ground. Inside we saw a group of very cute and very well-behaved 3-7 year old orphans playing peacefully together. The monastery was not only an abode for priests, but it also doubles as an orphanage. 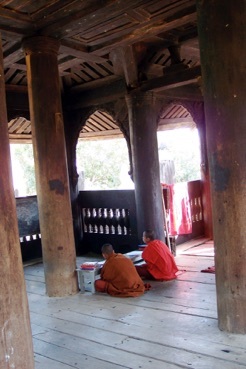 Like most monasteries in Myanmar, the furnishings are sparse. This 90 feet high masonry watchtower is all what remains of a palace built by king Bagyidaw. In the earthquake of 1834 most for the palace was reduced to ruins and the tower took a rather precarious tilt, so it is now called the “Leaning Tower of Inwe”. We climbed to the top to obtain a nice view of the surroundings. In the USA, attorneys of the owner would not have allowed us to climb this edifice because of the “liability” involved. You could feel the tilt of the building as you walk up, and some of the steps are not in very good shape anymore. Well, one of these days somebody will probably slip and fall down these stairs. This unusual brick and stucco monastery, shown on the left, was built in 1822 by Meh Nu, the number one queen of king Bagyidaw, for her abbot, U Bok. Monasteries in those days were built of wood, so this structure is rather unusual. It did withstand the ravages of time much better. Now it is a somber and uninhabited building and they say it is haunted, because the queen was apparently assassinated here. 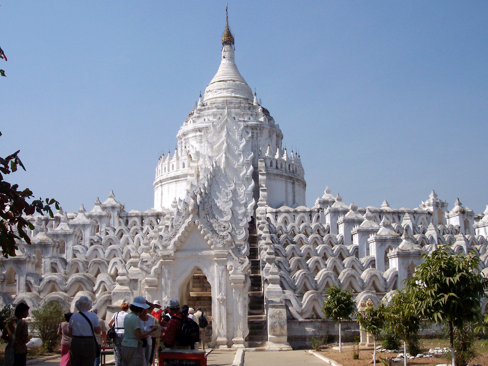 But next to this somber edifice is the Maha Aungme Bonzan Paya, a much more cheerful white-washed temple complex, complete with a white, gold-trimmed zedi in the center. From Inwe we took the ferry back to the other side of the Myitnge river, and then we had to fight our way again through the horde of hawkers to our waiting bus. Our next destination was Sagaing, so we crossed the 16-span Ava bridge, built in 1934 by the British. Until 1998, when a Chinese-engineered bridge was completed at Pyay, the Ava Bridge was the only bridge to cross the Ayeyarwady river. The British demolished two spans in 1942 to deny passage to the advancing Japanese army and it was not until 1954 when the spans were repaired and the bridge put back in operation. The Ava bridge was heavily patrolled by soldiers and all vehicles were inspected prior to entering the bridge. Photography of the bridge or from the bridge is not allowed. t in the air. It was modeled after the Mahaceti (Great Stupa) in Sri Lanka, although legend says that it was modeled after the breast of a Myanmar queen. left: The Sri Lanka style Rajamanisula Temple. 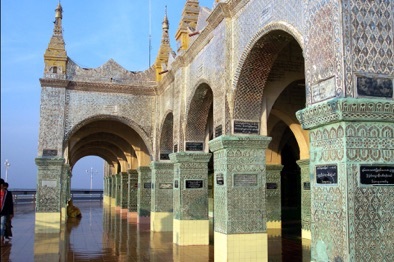 The temple was built in 1636 to commemorate the establishment of Inwe as the capital of Burma. Around the base are some 120 niches with images of “Nats”(a) In the temple itself there is abundant use of mirrored glass tiles on the columns and walls of the temple. On the large inside courtyard around the great globe were vendors selling food, toys, thanaka logs, and a variety of items for the local visitors to the temple. Note the cages in the foreground. Inside them are small birds for sale. The woman has a small baby owl in her hand. 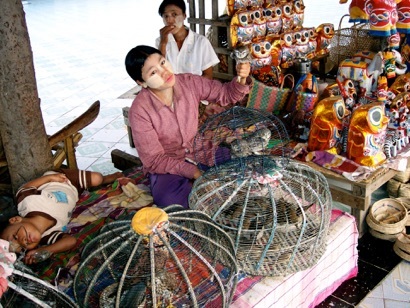 You buy these birds and then release them, thereby gaining merit in heaven. In some other stalls you can find doves and little turtles, all for the same goal. Note also that the woman vendor and the man in the back have white paste on their cheeks. This is a quite common sight everywhere in Myanmar, maybe not so much in the big cities. This whitish stuff is thanaka paste, which acts as a combination of moisturizer, sunscreen, and it has a fragrance somewhat similar to sandalwood. It helps remove acne and promotes smooth skin. It also has anti-fungal properties. For over 2000 years it has been the acknowledged beauty secret of Myanmar women. Some women smear it over their whole body at night. It is made from the ground bark of the thanaka tree, (Murraya paniculata). which grow abundantly in central Myanmar. Thanaka trees are perennials and a tree must be at least 35 years old to yield good-quality cuttings. We stopped at a silversmith shop, which was a waste of time, but which seems to be a standard procedure if you let the guides have their way. Artisans were showing the simple tools they used to imprint intricate bas-reliefs on silver cups, boxes, etc. So it was late dusk when we reached U Bein’s bridge, which the guide would have skipped had I not insisted on going there. This is a remarkable 1.2 km long foot bridge leading across the shallows of Thaungthaman(b) Lake. The bridge, which has 1060 posts, is made completely out of teak and after 200 years of service it is still in very good shape. It is the longest teak bridge in the world. There are several shaded areas on the bridge and many food stalls at the start of the bridge and there was a lot of traffic on it when we were there. 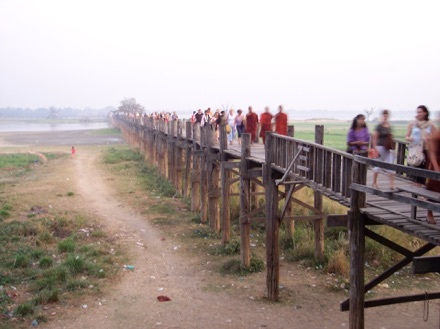 Below: U Bein’s Bridge, the longest bridge in the world made of teak. Dinner was at the Green Elephant Restaurant and we stayed at the Mandalay Sedona Hotel. As befitting a 5 star establishment, they charge $11/min for telephone calls to the USA and internet access was $5 for 30 minutes. They also provided only two small bottles of water for drinking. You have to pay if you want more. Drinking water out of the tap is not recommended in all of Myanmar, unless you are sure your stomach is lined with lead; or better yet, with gold. We left in the morning to catch a boat on the Ayeryawady River to go to Mingun, about 11 km upstream on the opposite side of the river. It was a very pleasant boat ride on the deck of a covered barge. Our first destination was Mingun Paya, the world’s largest pile of man-made rubble. 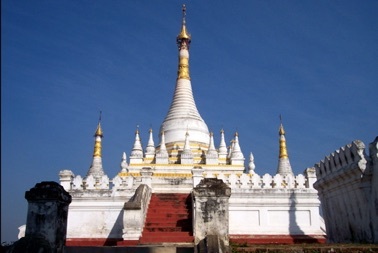 King Bodawpaya had in mind to build a pagoda which would reach the base of Heaven. It would be 450 feet high, or three times the height of the present ruins. Construction started in 1790 using thousands of slaves and stopped when the king died in 1819. In 1838 an earthquake caused two large fissures to appear in the face of the monument. We walked the 200+ steps to the top of this dilapidated rubble heap, on our bare feet perforce, because there are still figures of Buddha in the paya. As we nursed our sore feet we did enjoy from the top the fine view of the river, the village and the surrounding temples. right: The ruins of Mingun Paya. To get impression of size, see the man in the lower left corner. To get to the other sights from Mingun Paya, the furthest one about 500 feet away, some of our group took an oxcart. It was very touristy, and it supported the local economy. That way one would also miss walking by the rows ands rows of shops selling snacks, souvenirs and assorted knick-knacks. Our first stop was at the Mingun Bell, the largest hanging, uncracked bell in the world. (c) King Bodawpaya had decided to also cast the largest bronze bell in the world to go with his stupendous paya. The bell weighs 90 tons, is about 12 feet high and is about 15 feet across the lip. 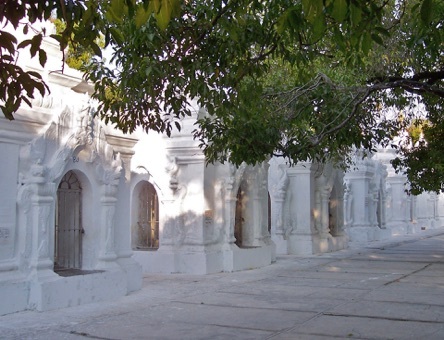 This white-washed stucco temple, also known as Myatheindam, shown on the left, is one of the most beautiful payas on our tour. It was built by king Bagydaw in 1816 in memory of his late senior wife, the Hsinbyume princess. 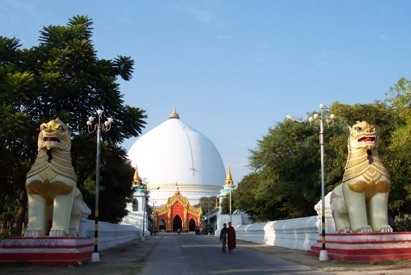 The temple represents Sulamani Paya, which stands on the top of Mt. Meru, the mountain which, according to the Buddhist scheme of things, stands at the center of the universe. Around the temple are seven wavy terraces, symbolizing the seven mountain ranges around the mountain.  Everything was white. 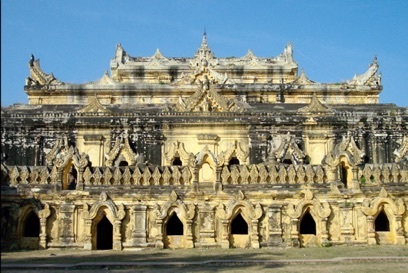 The structure was also badly damaged in the huge 1838 earthquake, but it was restored in 1874 by king Mindon. The picture on the top of this page shows the frontal view of this Paya. We took our barge back to Mandalay and had lunch at Nandar Restaurant, close to the jetty. They had a nice open-air pavilion built high on the banks of the Ayeryawady river with wonderful views. After lunch we drove to the Royal Palace, which was in this huge, 4 by 4 km large walled compound. The palace itself looked suspiciously like all the previous palaces we have seen, but this one maybe a little larger. This is a good example of the saying: “once you have seen one, you have seen it all ... “. Lots of crimson and gold, curved roofs, but the style is similar. As Norma remarked: “I have seen this place before .... “. King Thibaw used to live here when the British forces seized the city and sent the king to India in exile. The British then used the palace as the colony’s Government House and British Club. Major portions of the original palace were destroyed in WWII and what we now see is the reconstructed version. The Shwe In Bin Kyaung Monastery. Our next stop was the Shwe In Bin Kyaung monastery, built completely out of teak, which had been commissioned by a pair of wealthy Chinese jade merchants. It was built in 1895 and the locals call it the “teak monastery”. The doors, walls, balustrades and the roof cornices are covered with detailed engravings. King Thibaw apparently used this place occasionally as a royal apartment. 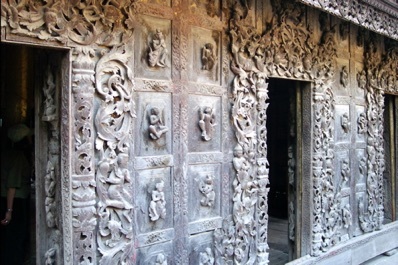 right: The ornately carved walls of the “Teak Monastery”. 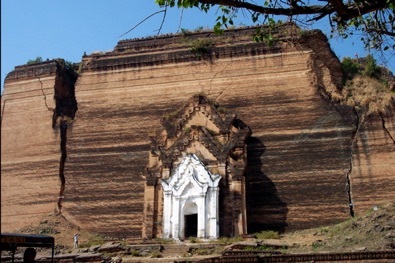 left: Part of the Kuthodaw Paya. Each of the small white stupas to the left houses a slab of the Tripitaka. In 544 BC the first Buddhist Synod was held, just 3 months after the demise of lord Buddha. And it was more than 2400 years later, that King Mindon convened the 5th Buddhist Synod at his palace in Mandalay. That was in 1871 and at that time a team of 2500 Sayadaw monks from five Buddhist countries recited and edited the Tripitaka treatises in a non-stop relay lasting 6 months. 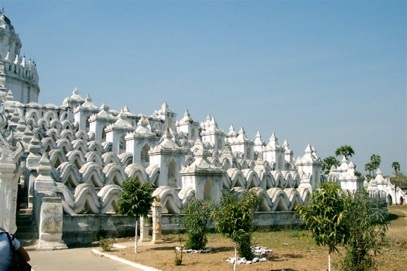 The temple complex covers 13 acres of land to contain the main and auxiliary zedis, as well as the 729 small white stupas. The main gilded pagoda itself is quite large and stands 188 feet high. Inside the buildings the decorations are opulent. King Mindon had this complex built starting in 1859. 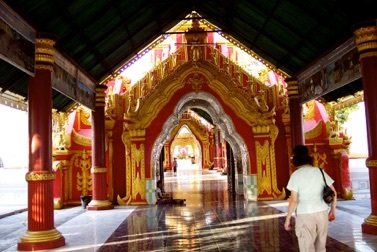 Right: One of the hallways in the temple complex, awash in red and gold decorations. Our bus took us to the base of Mandalay Hill, where we were transferred into pickup trucks with two parallel wooden benches in the back. These trucks are the only vehicles allowed to go up the steep, narrow switchback road to the top. The other choice is to walk up the 700 feet high hill, which is apparently not too bad, except that you have to do that on your bare feet. That was the real challenge. The pickup trucks scream up the hill and stop at the top; well, almost. You still have to take off your shoes and enter an elevator which takes you to the platform on the real top. Below: The temple on the top of Mandalay Hill. There is a temple, lavishly adorned with glass tiles, and an open air-platform to enjoy the view, which was, as expected, rather hazy. We have come to expect most views in the Far East to be hazy because of pollution and smog in the air. It was still a popular place to watch the sunset, and there were throngs of people doing just that. We decided to skip 15 minutes early to avoid the the crush of departing tourists. (a): Nats are spirits, which have been revered since pre-Buddha times. (b): Thaungthaman was an ogre who was looking for the lord Buddha. (c): The largest bell is in Moscou, but that one is cracked. (d): The three pitakas (baskets) possibly refer to three baskets holding the set of palm leaves on which the texts were originally written.